I am really having trouble understanding something after being in the US for the last few days. 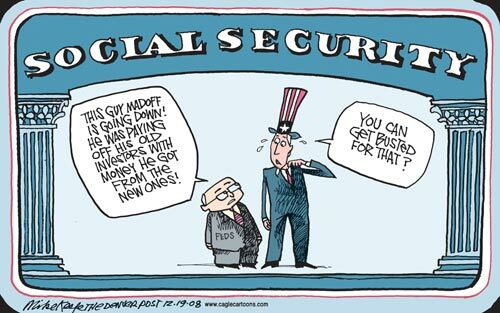 The news is being dominated by discussion of the new government funding plans and how they could affect Social Security. And I am wondering if I am the only one who thinks there is something rotten in the state of Washington D.C. When the accounting executives of companies like ENRON used the employees' pension funds to cover their spending and eventually their mounting debt, those guys were sent to jail because according to U.S. law, it is illegal to spend money that has been paid in by employees toward their pensions. Now the U.S. government, in its "debt talks" (yeah, WHY are we just NOW having those??) 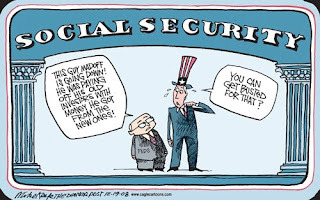 has warned that there is a possibility that Social Security benefits could be affected (or cut or even lost) because of the solutions being proposed. So in essence, as a way to cover their spending and eventually their mounting debt, the government is considering dipping into the funds that many seniors 1) paid into all their lives and 2) depend on for their livelihood. I really do not understand how these 2 situations are different from one another. And honestly, it makes me sick to my stomach to think about an 80 year old lady, sitting in her apartment right now, wondering if she will receive her SS check next month so she can afford to buy groceries and pay her rent... THAT SHOULD NEVER HAPPEN! 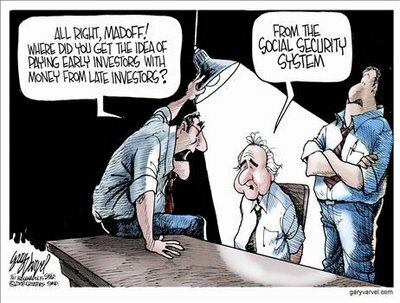 About 7 years ago, I guess, one of those 403b companies came to the school where I was working to tell us about retirement funds and, even though none of us pay in to Social Security, a discussion ensued about how SS wouldn't really provide a living wage for those who receive it in the next 10-20 years. Also brought up at that meeting was the idea of SS not being available AT ALL. So-- none of this really surprises me. The government has done nothing but steadily spend more money... there's no way there will be enough for all individuals/programs at that rate. Wait til national parks, monuments, landmarks, and other similar things start suffering. Disaster.